He’s left Barnsley and gone back to <?xml:namespace prefix = st1 ns = "urn:schemas-microsoft-com:office:smarttags" />Luton, the club from whom he joined the Tykes only in January. Having been released by the Clarets at the end of the 2002/03 season he looked all set to join Chris Brass at York, he had played for the Minstermen a year earlier. That was called off because of a back injury when York couldn’t get the necessary insurance and the keeper started the season out of work. Bradford were his first port of call, just as he was about to move in at Plymouth, and after a short spell at the Bradford & Bingley Pulse Flamingo Land Pension Fund Valley Parade Stadium he joined Luton. The Hatters were keen to sign him long term at the end of his three month deal but without a word he sneaked off to Barnsley and an 18-month contract. Having got that longer contract it was hardly expected that he would be involved in the transfer news again. That’s the case though and he has moved back to Luton after further problems with his back which ruled him out at the end of last season for Barnsley. 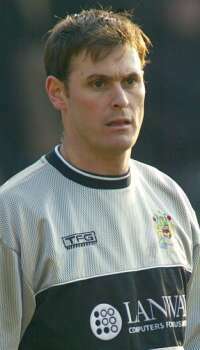 He will rejoin Luton next month where he will also be responsible for coaching the younger keepers.